This mid-block building is located close to the street (on the south side) at 72 and 74 Holland St. East. It was built in the 1870’s (after the fire of 1871) in the Neoclassical Duplex style. According to historic maps, it may have been one of a pair of buildings built side by side on Holland Street. 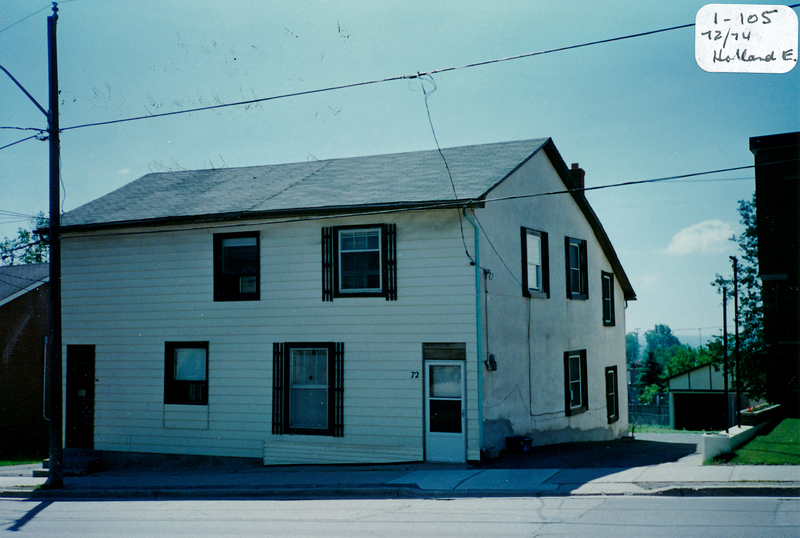 The Prolbert family lived at 72 Holland St. East for many years. “Pentypool” worked for Bill Sutton and was a sign painter. The house at 74 Holland St. East was rented to a number of people, including Jim and Jane Armstrong (when they were first married). Later it was the home of Dan Collings, Mrs. Campbell, Neil and Dorothy. Dorothy was Dan’s housekeeper for many years. He built a horse stable and had a team. Barney Campbell drove the team on the marsh to and from sales. 1-105 72 and 74 Holland E.